Half the fun of a Bloody Mary are the fixins, so pile yours high with this set of stainless steel picks. Whether you're a celery-and-olive purist or an asparagus-and-radish kookster, half the fun of a Bloody Mary are the fixins. Pile yours high and proud with this set of two stainless steel picks. Their tree-inspired shape encourages you to, yep, "branch" out with your garnishes. Stick with spicy Mary, or use them to stack colorful fruit in mimosas or screwdrivers. The set makes a fun gift for the friend who thinks brunch should be an Olympic sport. Made in Buffalo, New York. When one majors in Modern European History, the next logical move is to design products. At least it was for Alex Cornwell. An entrepreneurial spirit runs in his family, so he ran with it, too. Alex now designs products with his wife Marta, along with their team, that “celebrate the homegrown and homemade in your life.” Alex and Marta live and work in Buffalo, New York. We like the occasional Bloody Mary with our own "special" recipe. 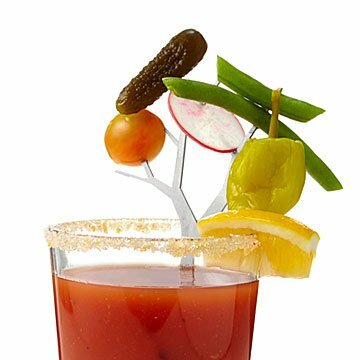 We also like the "meal-in-a-glass" approach to Bloody Mary night and this cool cocktail branch makes that easier! It looks great in a glass. Perfect for the Bloody Mary enthusiast! Loading up bloody Mary's with all the fixings just make the drink that much better! My boyfriend loved this gift. He was excited to test them out with his mix that he has created. He loves that he can space the garnishes out and not waste a toothpick every time he makes this cocktail. He likes that they are stainless steel and re-usable. Fun Gift for my Son! Jake will enjoy being creative with his Bloody Mary add-ons and will like sharing them with friends, too. Gave this as a gift on a Christmas Eve and tried them out Christmas morning! These work perfectly. The only thing i wish was that some of the smaller branches were more spread out so they could fit bigger items.